American Society of International Law (ASIL) - ASIL's purpose is to educate and engage the public in international law and to expand its frontiers as a vehicle for resolving disputes and international conflict. Full-text materials and resources; publications and activities information. ASIL Guide to Electronic Resources for International Law - Development project of the American Society of International Law. Asylumlaw - Find information about seeking asylum, including finding an agency or lawyer to help you, in 35 countries around the world. Audiovisual Library of International Law - Consists of three pillars: (1) the Historic Archives containing documents and audiovisual materials relating to the negotiation and adoption of significant legal instruments under the auspices of the United Nations and related agencies since 1945; (2) the Lecture Series featuring a permanent collection of lectures on virtually every subject of international law given by leading international law scholars and practitioners from different countries and legal systems; and (3) the Research Library providing an on-line international law library with links to treaties, jurisprudence, publications and documents, scholarly writings and research guides. The Audiovisual Library is available to all individuals and institutions around the world for free via the Internet. Australian Law Reform Commission - The ALRC conducts inquiries - known as references - into areas of law reform at the request of the Attorney-General of Australia. Brill Online Books and Journals - Scholarly resource offering the full text of nearly 300,000 book chapters and journal articles, covering the humanities, international law and biology. British and Irish Legal Information Institute (BAILII) - British and Irish case law & legislation, European Union case law, Law Commission reports, and other law-related British and Irish material. British Institute of International and Comparative Law (BIICL) - Members of the Institute have access to its meetings, publications, research projects and specialist staff. Center on Democracy, Development, and the Rule of Law (CDDRL) - Promotes research to assist developing countries and transitioning societies in the design and implementation of policies to foster democracy and to advance the rule of law. Part of Stanford University's Institute for International Studies. Coalition for the International Criminal Court - A network of well over 1,000 non-governmental organizations (NGOs) advocating for a fair, effective and independent International Criminal Court (ICC). Complete Research Guide to the Laws of the People's Republic of China (PRC) - By Wei Luo, Director of Technical Services and Lecturer in Law at the Washington University School of Law Library and Joan Liu, a librarian at the New York University School of Law Library. Conducting Research in Public International Law - Information sources of public international law. Treaties, case law, documents, literature, and reference aids. Constitutions of the World - National constitutions worldwide. Cornell Legal Research Encyclopedia - The law librarians at the Cornell Law Library are creating this compilation of U.S. and International legal resources. The Legal Research Encyclopedia is a topical and jurisdictional arrangement of all available formats, including print, microform, CD-ROM, WESTLAW, LEXIS and the Internet. Citation to research tools and direct links are provided. Electronic Information System for International Law (ESIL) - Developed by the American Society of International Law (ASIL), EISIL is an open database of authenticated primary and other materials across the breadth of international law. Environmental Treaties and Resource Indicators (ENTRI) - Search service for finding information about environmental treaties and national resource indicators. Eur-Lex - Full body of European Union legislation in all electronic formats. FindLaw: International Law - International law links. FLAG Foreign Law Guide - Contains collection descriptions of primary materials in print format for foreign jurisdictions held in UK libraries. FLARE Project: Foreign Law Research - A collaboration between the major libraries collecting law in the United Kingdom - Institute of Advanced Legal Studies, Bodleian Law Library, Squire Law Library, British Library, and School of Oriental and African Studies - working to improve the accessibility of foreign legal materials. Fletcher-Ginn-Multilaterals Project - An ongoing project at The Fletcher School of Law & Diplomacy, Tufts University, to make available the texts of international multilateral conventions and other instruments. Global Legal Monitor - An online publication from the Law Library of Congress covering legal news and developments worldwide. It is updated frequently and draws on information from the Global Legal Information Network, official national legal publications, and reliable press sources. GlobaLex - International law research resources from NYU's Hauser Global Law School. Guide to Foreign and International Legal Databases - Provided by New York University School of Law. Hague Conference on Private International Law - An intergovernmental organization, the purpose of which is to work for the progressive unification of the rules of private international law. How2Immigrate - Full service international immigration advisory firm for USA, Canada, Australia, New Zealand and Brazil. HUDOC Portal - Provides free online access to the case-law of the European Court of Human Rights, the European Commission of Human Rights and the Committee of Ministers. International Consitutional Law Project (University of Bern) - Provides English translations of and other textual material related to constitutional documents. Cross-references those documents for quick comparison of constitutional provisions. International Criminal Court (ICC) - The ICC was established by the Rome Statute of the International Criminal Court on 17 July 1998, when 120 States participating in the United Nations Diplomatic Conference of Plenipotentiaries on the Establishment of an International Criminal Court adopted the Statute. This is the first ever permanent, treaty based, international criminal court established to promote the rule of law and ensure that the gravest international crimes do not go unpunished. Also see the Coalition for the International Criminal Court (CICC). First criminal conviction in ICC was conviction of former Congolese warlord Thomas Lubanga for using child soldiers in March 2012.
International Criminal Tribunal for the former Yugoslavia (ICTY) - The ICTY, established by Security Council resolution 827, and national courts have concurrent jurisdiction over serious violations of international humanitarian law committed in the former Yugoslavia. However, the ICTY can claim primacy over national courts, and may take over national investigations and proceedings at any stage if this proves to be in the interest of international justice. International Development Law Organization (IDLO) - Provides technical legal assistance and capacity development at the national and local level, often in the poorest and most insecure parts of the world. We work in partnership with local actors and with different legal systems in an enabling and empowering - rather than prescriptive or directive - way. IDLO was granted Observer Status by the United Nations General Assembly in 2001. It is supported financially by voluntary contributions from governments, multilateral organizations, private foundations and the private sector. International Law Commission - Established by the United Nations General Assembly in 1947 to promote the progressive development of international law and its codification. The Commission meets annually. It is composed of 34 members elected by the General Assembly for five year terms who serve in their individual capacity, not as representatives of their governments. International Law Journals - A compilation provided by University of Chicago D'Angelo Law Library. International Law - United Nations international law site: Treaties, International Court of Justice, Law of the Sea, International Criminal Court, International Trade Law, International Criminal Tribunal for the Former Yugoslavia (ICTY), Codification, Development and Promotion of International Law, International Law Commission, United Nations Documentation Research Guide. International Law Aspects of the Iraq War and Occupation - Examines the legality of the US-UK war on Iraq. Many legal experts describe the US-UK attack as an act of aggression, violating international law. Experts also point to illegalities in the US conduct of the war and violations of the Geneva Conventions by the US-UK concerning the responsibilities of an occupying power. International Law: An Overview - Resources and overview from Cornell Law School. International Legal Materials - Published bimonthly since 1962. Each 250-page issue contains the full texts of important treaties and agreements, judicial and arbitral decisions, national legislation, international organizations resolutions and other documents. International Trade Law: An Overview - Resources and overview provided by Cornell Law School. International Tribunal for the Law of the Sea - The United Nations Convention on the Law of the Sea establishes a comprehensive legal framework to regulate all ocean space, its uses and resources. It contains, among other things, provisions relating to the territorial sea, the contiguous zone, the continental shelf, the exclusive economic zone and the high seas. It also provides for the protection and preservation of the marine environment, for marine scientific research and for the development and transfer of marine technology. One of the most important parts of the Convention concerns the exploration for and exploitation of the resources of the seabed and ocean floor and subsoil thereof, beyond the limits of national jurisdiction (the Area). The Convention declares the area and its resources to be "the common heritage of mankind ". The International Seabed Authority, established by the Convention, administers the resources of the Area. The Convention provides for four alternative means for the settlement of disputes: the International Tribunal for the Law of the Sea, the International Court of Justice, an arbitral tribunal constituted in accordance with Annex VII to the Convention, and a special arbitral tribunal constituted in accordance with Annex VIII to the Convention. Lauterpacht Research Centre for International Law - Home page of the Lauterpacht Research Centre for International Law at the University of Cambridge. 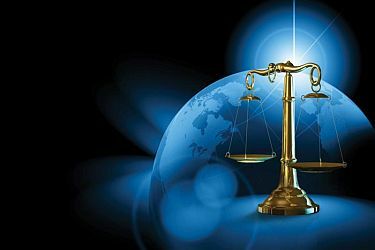 Global Legal Information Catalog - Sources that reprint the laws and regulations of international jurisdictions on specific legal topics. Global Legal Information Network - Online sources of legal information on government & law by U.S. state, country, or region. Guide to Law Online - Online sources of legal information on government and law by U.S. state, country, or region. International - Multinatinal legal database, law reviews, treaties, OAS and United Nations inforamtion and resources. Legal Blawgs - Web archive of more than 100 blawgs. Nations - Guide to law in nations and associated jurisdictions worldwide. LLRX: International Law Guides - Collection of articles on international law and international law research. Marine & Coastal Treaties - Links to marine and coastal treaties. Market Access Sectoral and Trade Barriers Database - Country reports in the sectoral database have a similar structure, consisting of: a general description of the country's trade policy, two different parts for goods (tariff and non-tariff barriers), and three separate sections for investment, services and Intellectual Property Rights (IPR). Max Planck Encyclopedia of Public International Law (MPEPIL) - Online edition, edited by Rudiger Wolfrum. This is a fully updated online edition of the Encyclopedia of Public International Law published in print between 1991 and 2001 under the general editorship of Rudolf Bernhardt. Multilaterals Project: International Multinational Conventions - International multilateral conventions and other instruments. Although the project was initiated to improve public access to environmental agreements, the collection today also includes treaties in the fields of human rights, commerce and trade, laws of war and arms control, and other areas. North American Free Trade Agreement (NAFTA) Secretariat - On January 1, 1994, the North American Free Trade Agreement between the United States, Canada, and Mexico entered into force. All remaining duties and quantitative restrictions were eliminated, as scheduled, on January 1, 2008. NAFTA created the world's largest free trade area, which now links 450 million people producing $17 trillion worth of goods and services. Nottingham International Law and Security Centre (NILSC) - Area of research covered by NILSC encompasses issues of human, political, military, socio-economic, resources and energy security. These all raise questions for international law. Permanent Court of Arbitration (PCA) - An intergovernmental organization with 117 member states. The PCA provides services for the resolution of disputes involving various combinations of states, state entities, intergovernmental organizations, and private parties. Rule of Law in Armed Conflicts Project - An initiative of the Geneva Academy of International Humanitarian Law and Human Rights to support the application and implementation of international law in armed conflict. Through its global database and analysis, the Project aims ultimately to report on every concerned State and disputed territory in the world, considering both the legal norms that apply as well as the extent to which they are respected by the relevant actors. Transboundary Freshwater Dispute Database - Searchable database of summaries and full text of 150 water-related treaties and 39 interstate compacts within the U.S.
United Nations Research Guide - From Columiba University's Arthur W. Diamond Law Library Research Guides. URLAW Legal Research Center: International Law and Government A-Z - International law resources links. VERTIC - Promotes effective and efficient verification as a means of ensuring confidence in the implementation of international agreements and intra-national agreements with international involvement. Programs concerning peace agreements, arms control and disarmament, and the environment. World Legal Information Institute - Legal directory and search engine - legislation, case-law, journals, law reform, by country and subject. A Guide to the Israeli Legal System by Ruth Levush - Overview and backgrounder to the Israeli legal system. Also provides additional resource links. Australasian Legal Information Institute (AustLII) - Australian legal materials. Best Guide to Canadian Legal Research - Strategies and techniques for Canadian legal research, finding and using secondary sources, finding and analyzing cases, updating your research, legal writing, legal research FAQs. Bosnia & Herzegovina: Constitution, Government and Legislation - Legal reserch guide from JURIST. British and Irish Legal Information Institute - Comprehensive access to freely available British and Irish public legal information. Canada: Department of Justice - Supports the Minister of Justice, provides legal services and counsel to the governmen. Programs and Services, News and Events, Justice Canada (quarterly newsletter published by the Department of Justice), the Canadian Justice System and more. Canada: Justice Laws - Consolidated Acts and regulations of Canada. The consolidations are generally updated on a weekly basis. Canada's Constitution - The Constitution of Canada (La Constitution du Canada in French) is the supreme law in Canada; the country's constitution is an amalgamation of codified acts and uncodified traditions and conventions. It outlines Canada's system of government, as well as the civil rights of all Canadian citizens. See Constitution Acts, 1867 to 1982. Canadian Charter of Rights and Freedom - A bill of rights entrenched in the Constitution of Canada. It forms the first part of the Constitution Act, 1982. The Charter guarantees certain political rights to Canadian citizens and civil rights of everyone in Canada from the policies and actions of all levels of government. It is designed to unify Canadians around a set of principles that embody those rights. The Charter was signed into law by Queen Elizabeth II of Canada on April 17 1982. See Charter's full text. Canadian Legal Information Institute (CanLII) - CanLII, Canada's main source of free access to primary legal material. China Law Center - Yale Law School's China Law Center has two missions: first, to assist the legal reform process within China; and, second, to increase understanding of China's legal system outside of China. Constitutional Court of the Republic of Korea - The functions of the Constitutional Court include deciding on the Constitutionality of Laws, ruling on Competence Disputes between governmental entities, adjudicating Constitutional Complaints filed by individuals, giving final decisions on Impeachments, and making judgments on Dissolution of Political Parties. Court of Justice of the European Union (CJEU) - Interprets EU law to make sure it is applied in the same way in all EU countries, and settles legal disputes between national governments and EU institutions. InfoCuria - Case law of the Court of Justice. Search for a Case - Search for a case before the Court of Justice, General Court, or Civil Service Tribunal. Council of Europe - An intergovernmental organisation which aims to protect human rights, pluralist democracy and the rule of law. The Council of Europe covers all major issues facing European society other than defence. Its work programme includes the following fields of activity: human rights, media, legal co-operation, social and economic questions, health, education, culture, heritage, sport, youth, local democracy and transfrontier co-operation, the environment and regional planning. CURIA - Transit page for European Union, Court of Justice of the European Communities, national and international law and case law. EUR-Lex - Portal to European Union law: Official Journal of the European Communities, treaties, legislation, legislation in preparation, case law, parlimentary questions, documents of public interest. Europa - Europa is the portal site of the European Union. It provides up-to-date coverage of European Union affairs and essential information on European integration. Users can also consult all legislation currently in force or under discussion, access the websites of each of the EU institutions and find out about the policies administered by the European Union under the powers devolved to it by the treaties. European Court of Human Rights - Set up under the European Convention on Human Rights. European Journal of International Law - International law journals. Foreign and Transnational Legal Forms - Emphasis is on transactional forms (instruments), rather than litigation forms, but some litigation forms (also called pleadings or court forms) are included. Guide To European Legal Databases - Presented by Mirela Roznovschi, the reference librarian for International and Foreign Law at New York University School of Law Library. International Law Dictionary and Directory - Definitions of words and phrases used in private and public international law with linked cross-references to related words and phrases. Descriptions of international organizations with links to their on-line home pages and to other important materials describing the organizations. Acronyms of international organizations with links to the definitions for those organizations. Descriptions of countries with links to their official on-line home pages and to other important materials. International Law Observer - A blog dedicated to reports, commentary and the discussion of topical issues of public international law as well as EC/EU-law. Israel/Palestinian Agreements - Texts of agreements reached between Israel and Palestinians. Latin America Information Center (LANIC) - Comprehensive site facilitates access to Internet-based information to, from, or on Latin America. Laws and Regulations of Canada - Official site. Legal Resources in the UK and Ireland - Legal information for individuals, companies, lawyers, and students. Mexican Law - Electronic resources from the U.S., Mexico, and international organizations. Overview of Sources of Canadian Law on the Web by Louise Tsang - Overview and backgrounder to the Canadian legal system. Also provides additional resource links. Researching Australian Law - Resources comiled by Nicholas Pengelley and Sue Milne at LLRX.com. Researching U.S. Treaties and Agreements - Research information advice provided by Marci Hoffman, International & Foreign Law Librarian at the E.B. Williams Law Library, Georgetown University Law Center. Special Tribunal for Lebanon (STL) - Primary mandate is to hold trials for the people accused of carrying out the attack of 14 February 2005 which killed 22 people, including the former prime minister of Lebanon, Rafiq Hariri, and injured many others. Supreme Court of Canada - Rules, policies, cases, library, additional resources. Also see the Lexum collection, which contains Supreme Court of Canada judgments since 1907 and judgments in leave applications since 2006. The collection is updated within minutes of the public release of the judgments by the Court. Supreme Court of the United Kingdom - The highest court in the United Kingdom. The Court hears appeals on arguable points of law of the greatest public importance, for the whole of the United Kingdom in civil cases, and for England, Wales and Northern Ireland in criminal cases. Additionally, it hears cases on devolution matters under the Scotland Act 1998, the Northern Ireland Act 1988 and the Government of Wales Act 2006. Also see Live Hearings TV Coverage. Supreme People's Court Monitor - Susan Finder has been observing the Supreme People's Court for over 20 years. She is a Distinguished Scholar in Residence at the School of Transnational Law of Peking University (Shenzhen) and in the fall of 2015 was an Adjunct Professor with the Faculty of Law of the University of Hong Kong and is affiliated with its Centre of Chinese Law. Treaties, Laws and Diplomacy - Resources provided by the Air War College: Biological, Chemical, Space, Missile and Nuclear Treaties and International Law & Diplomacy. U.S.-Central American Free Trade Agreement - On August 5, 2004, the United States signed the Dominican Republic-Central America-United States Free Trade Agreement (CAFTA-DR) with five Central American countries (Costa Rica, El Salvador, Guatemala, Honduras, and Nicaragua) and the Dominican Republic. The CAFTA-DR is the first free trade agreement between the United States and a group of smaller developing economies. Union List of Holdings of European Legal Gazettes - Official gazettes are basically the medium by which national and sub-national governments officially disseminate new legislation, regulations, orders and decisions of government bodies, and official announcements, although not always in full text. Some gazettes also contain the texts of international agreements, court decisions and legislative debates. This webpage last updated on Thursday, July 27, 2017 5:40 PM.